Variable Gain Amplifiers (VGAs) are amplifiers that are used for signal conditioning to set its voltage can be set electronically. Amplified gain of these amplifiers can be controlled through analog voltage, which in turn can be controlled through a direct current (DC) source, functional source or through digital to analog converters. These amplifiers are capable of providing wide range of gains based upon the application. Globally expanding healthcare industry and increasing demand, adoption of digital VGAs is expected to remain key growth driver for VGAs during the period of study. 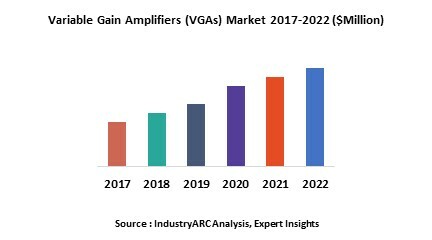 This report identifies the variable gain amplifier market size in for the year 2015-2017, and forecast of the same for year 2022. It also highlights the potential growth opportunities in the coming years, while also reviewing the market drivers, restraints, growth indicators, challenges, market dynamics, competitive landscape, and other key aspects with respect to variable gain amplifier market. Geographically Asia-Pacific dominated variable gain amplifier market driven by higher demand and presence of large number of consumer electronics end use industry in the region. Asia-Pacific was followed by North America and Europe as the second and third largest market for variable gain amplifiers in 2015. However, expanding electronics industrial base, increasing demand of electronics products in developing nations of the Asia-Pacific is expected to make region fastest growing regional market during the period of study.